Dissemination of tools for rapid prototyping through 3D printing and evolution of software for digital modeling to parametric methods excited great interest inside the world of fashion. Designers created many experiments at different levels of scale: from fabrics with three-dimensional textures to dresses and accessories modeled directly in three dimensions around the body of the wearer. After this first phase of great enthusiasm and since the researchers are already beginning to present the next technological evolution, 4D printing, it’s time to make a critical reflection on the potential, and also the limits of computational fashion design. To understand exactly what 3D printing means, we have to do a little jump back and remember its origins. 3D printing is an additive manufacturing technique and it allows to realize three-dimensional elements adding material to material, differing from the production techniques previously invented, which proceed by subtracting material from a starting block of material (for example lathes and milling machines). 3D printers are also CNC machines (Computer Numerical Control machines), i.e. 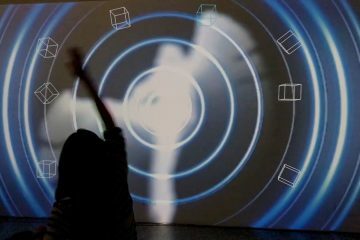 machines that are managed by a computer that interprets a digital model created through a CAD (Computer Aided Design) software and turns it into instructions to be executed by the machine itself, to physically realize the model drawn digitally. To do this, the computer uses a CAM (Computer Aided Manufacturing) software. The raw materials that can be printed, are in the form of powders, liquids or sheets and consist of polymers, metals or ceramics. Stereolithography is a method for creating objects fixing thin layers, one over the other one. These layers are made of resins, composed of photopolymers (i.e. materials which react to exposure to ultraviolet light). Subsequently, based on the concept of the union of thin layers of material, other technologies such as Selective Laser Sintering, Electron Beam Melting  and Laminated Object Manufacturing were also developed. 3D printing is applied in many production sectors including also the textile and fashion industry, where it is going to change not only the way we create garments, but also clothing design and textile design. In this sector, the CNC machines had already been used for a lot of time, but without changing the substance of the procedures behind the assembly of the clothes, simply going to automate and give more speed to established procedures. It is interesting however to note that what is considered a key predecessor of CNC machines is the programmable weaving loom invented in the eighteenth century by Joseph Marie Jacquard. 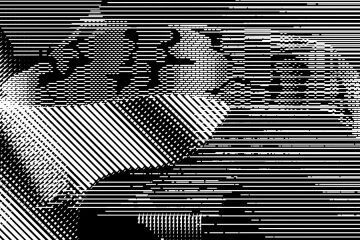 You could program the machine using perforated strips of matter, according to a binary code, that translated designs to be realized on the fabrics into instructions understandable for the loom. This invention allowed for the first time the creation of fabrics and knitted dresses with complex decorations, obtained through a specific technique of interlacing and employing numerous wires of different colors. As was mentioned in the previous paragraph, if you need to design an object for an additive manufacturing system, it is always necessary to translate the original idea into a digital model and then make that model understandable for the 3D printer. This translation of creative thinking through the use of computers, refers to the concept of computational design and implies a new way of conceiving shaping things. One of the pivotal points of computational design is information processing through algorithms. An algorithm is an ordered set of procedures organized according to a defined number of rules, adapted to define a sequence of operations in order to solve a specific problem. The theories of computational design originated within the field of architecture and were later transferred to the field of design and fashion. Fashion industry is particularly interesting because computational design is a recent conquest, closely linked with the spread of 3D printing, and a method that can often be applied at different levels of scale, from the creation of fabrics, to that of components and accessories up to entire outfits. The creation of 3D printed fabrics has led to a great change of what is meant by the word “fabric”. The term computational design includes other specific subsets such as parametric design and generative design. Through the analysis of some case studies and the words of some of the major players on the scene of computational fashion design, we will see how these concepts are reflected in the realization of innovative garments and new technologies for fashion. The first experiments for the application of 3D printing to clothes start around the begining of the twenty-first century. Their charm lies in the opportunity afforded by this productive technique of giving life to new forms and, in the case of architect Francis Bitonti‘s work , to dresses-sculpture with innovative aesthetics. In 2007 the architect founded the Bitonti Studio, characterized by close attention to the application of digital design and the CNC manufacturing technologies. Dita’s Gown, realised in 2013 for the icon of burlesque Dita von Teese, was designed by Francis Bitonti in partnership with Michael Schmidt, the company Shapeways (this company was also born in 2007 in New York, and it offers 3D printing services and technical advice) , and the company Swarovski. The cloth was made using the technique of laser sintering, fusing different layers of nylon. The design process took place using Rhino and Maya softwares, and it has been printed (with a process which lasted two days) using an EOS D50 in 17 parts, subsequently assembled by hand. “Swarowky Crystals were added by hand, it wasn’t difficult but there was a lot of labor.”  – in this way the architect describes the manual application, after the printing, of the crystals that light up the surface of the the dress and enhance its beauty, as well as soften the volumes thanks to the glitter of light. The merit of this creation, exposed in 2013 at the MAD museum , is the extreme fluidity of the draping of the skirt, which is perfectly analogous to that of a fabric. In order to investigate the potential of computational fashion design, in the summer of 2013 Bitonti also held at the Metropolitan Exchange  in Brooklyn the workshop “The New Skins” in collaboration with Thingiverse, which is a collaborative online platform for sharing and an open source repository of digital models for 3D printing,  founded by MakerBot. From the work of Bitonti Studio and a group of students were born clothes Verlan Dress and Bristle Dress. Bristle Dress is a mini-dress printed in PLA (or polylactic acid, a thermoplastic which, unlike the most part of plastics that are derived mainly from petroleum, is made from corn or potato starches and so it is therefore biodegradable), and using the MakerBot Flexible filament: a filament for 3D printing made of polyester. Respecting the open-source policy of Thingiverse platform, the files for 3D printing are still available on Thingiverse web site. The site also hosts the application Customizer App, developed by Studio Bitonti, allowing variation of some parameters in order to customize the dress: skirt flare and waist size. The ability to share patternmaking drawings in order to allow the reproduction of the same model from the user is a practice that is part of the fashion world, in which the 2D patternmaking drawings have always been the traditional way to represent, share and communicate structural and formal details of a dress. Just think of the proliferation of magazines that teach these techniques. However this process is not so widespread in product design industry. You could find some rare examples in the furniture industry, a sector in which most often the pieces to be assembled are provided to the user with some instructions for but he doesn’t need to produce the basic elements (as happens in fashion industry). In general, however, this strategy wasn’t applicable to the field of high-quality objects made of plastic, because of the need, before the invention of 3D printing, to produce such objects with moulding techniques and therefore too difficult to reproduce in a non-industrialized way. Another fascinating example of 3D printing is the work of threeASFOUR. Founded in 2005, it is a collective made up of three artists based in New York City, which mainly express themselves through fashion creations. It is formed by designers Gabriel Asfour, Angela Donhauser, and Adi Gil. In 2016, thanks to the collaboration with the architect and industrial designer Travis Fitch and Stratasys company , Harmonograph Dress and Pangolin Dress were created. The creative approach of threeASFOUR is half way between fashion and art and their design philosophy is based on merging innovative technology with traditional patternmaking, as Gabriel Asfour said: “Pangolin Dress essentially represents a game between 2D and3D. When we make a dress, we work around the human body in its three-dimensionality, but the actual panels with which they are constructed are two-dimensional. […] Only when we place them on the body, they become three-dimensional. For the Pangolin Dress we proposed also to explore different textures of animal skins and we have realized a structure formed by interlocking elements, similar to a patchwork, which allows the 3D printed fabric to move in 6 dimensions. In a manner similar to the skin of the crocodile, for example, which has various texutures for different parts in which different types of motion are required to the skin itself. […]. “. “Pangolin” is the name of a small mammal resembling an anteater, whose skin is covered with rigid overlapping scales, organized in a flexible structure that allows the little animal to roll up on itself. The black dress looks like a sort of flexible armor, divided into parts, which envelops the body until above the knee. In both clothes, the black 3D printed parts are fixed on a base of elastic fabric to make it more comfortable for the wearer. The design process took about six months: one month to realize bi-dimensional design, three months to achieve the three-dimensional digital model and finally two months to make the 3D printing tests. Once the design of the models is finished, Pangolin Dress (composed of 20 pieces) requires 400 hours printing, while Harmonograph Dress (composed of 10 pieces) requires 600 hours printing. Of course you can start in parallel different printing processes greatly reducing the time needed for production, but these numbers refer to the total amount of time required for each component. Create a 3D print dress leads to the generation of new forms, even very complex, and therefore raises issues relevant to the correct sizing of these geometries compared to the proportions of the human body, the fit and the development of different sizes. Investigate these aspects and make comfortable clothing is one of the most important challenges for computational fashion. All dresses that we talked about so far, as stated by their creators, were made mixing techniques of traditional tailoring systems to take body measurements and use of digitized forms of the human body. Also a New York based company is creating a system of technologies to solve these problems: Body Labs. The company is led by Bill O’Farrell, Co-Founder and CEO, Eric Rachlin, VP of Product Design and Co-Founder, Alex Weiss, VP Software Development and Co-Founder Michael Black, Co-Founder and Board Member. 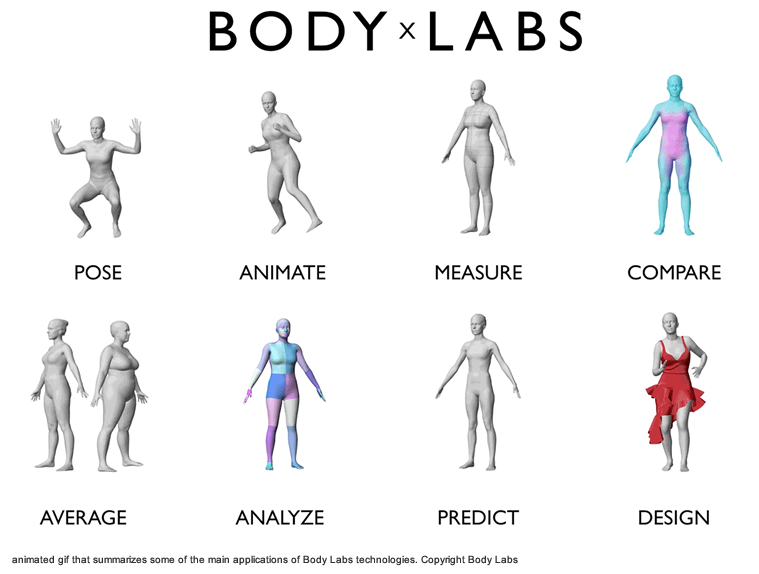 “Body Labs technology starts with artificial intelligence – trained on all possible body shape, pose and motion – which enables us to reference crude input sources such as 3D scanning, physical measurements or even 2D imagery to produce accurate 3D digital body shape” – in this way Jon Cilley, “chief evangelist” for Body labs,  describes Body Labs’ mission -”Working with three-dimensional digital models of the body you can follow different paths: use custom digital models, for the individual user [your unique 3D body shape], or average 3D models together to produce the average size of a population of users. All these technologies let you design tailored-made clothes. 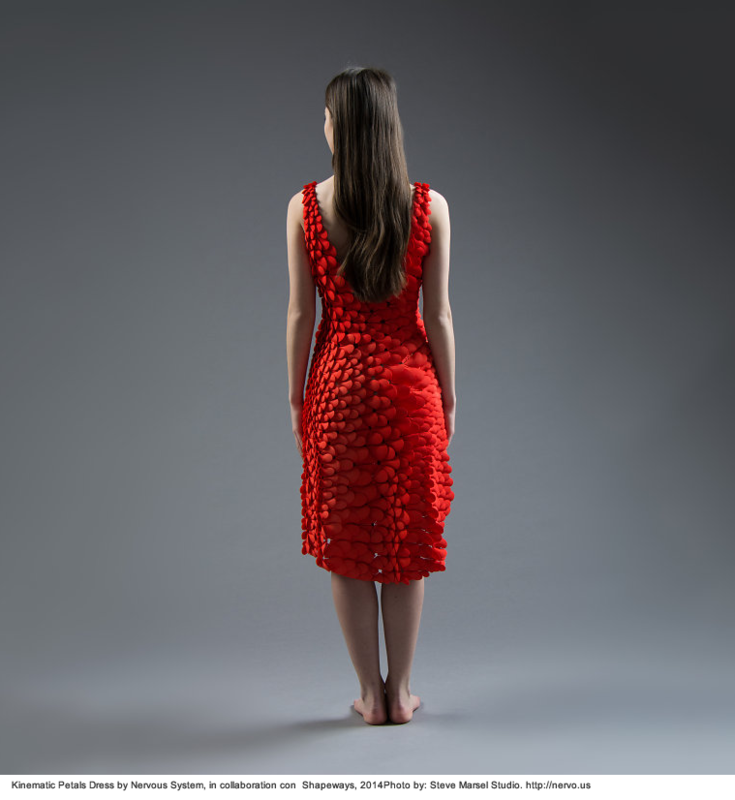 For example we worked with Nervous Systems  to realize a 3D printed dress designed precisely around the individual. 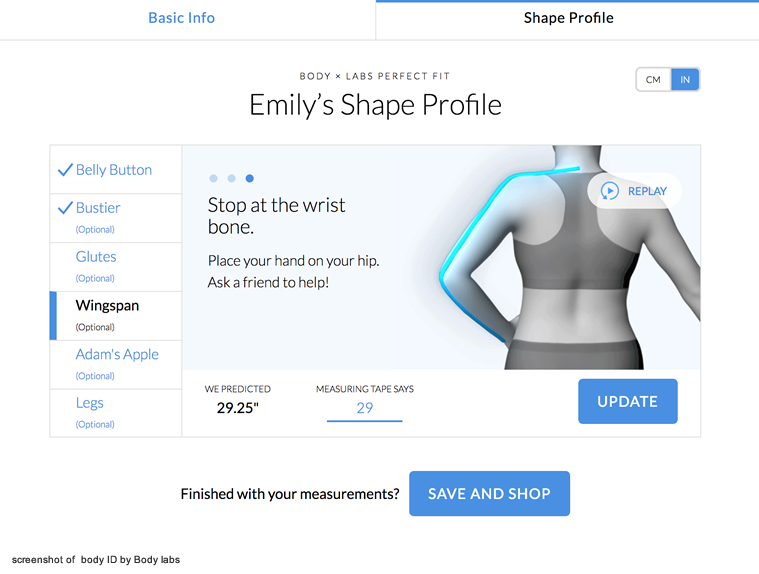 We developed a technology that can tell you what an individual looks like, what their measures are, their sizes, and create a custom size of the dress on top of that individuals accurate 3D digital body shape. All the above technologies are in the development phase end point but will be available in North America the end of summer 2016. Previously, some experiments of Body Scanners had been made, such as the system presented in 2009 at the Selfridges department store in London. But only in recent years, reduction of cost of technologies and improvement in precision level of measurements is making it possible to speculate much more effective design solutions, simple to use for the user and that can be interfaced with all possible applications of the fashion industry such as that made by Body Labs. The strength of these technologies is their compatibility with major CAD software for fashion, allowing designers to literally draw around the body and analyse the behaviour of textiles and clothing on the body in motion. 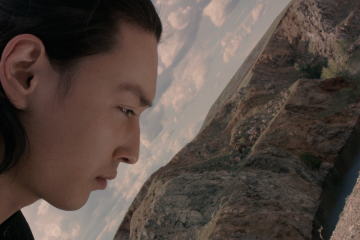 Through motion capture systems, i.e. scanning the body of a person while performing specific movements, you can retarget that body shape. This function is very useful for example in the design of clothing for sports, dance or theatre but also to animate the digital fictional characters by making them mimic the movements of actors. Another trend that will lead to interesting applications for computational fashion is the combination of 3D printing, materials science and synthetic biology. 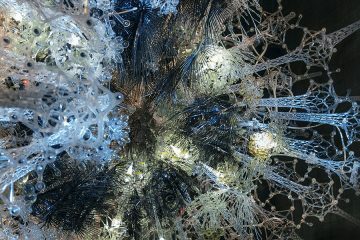 In this direction moves the research of architect and designers Neri Oxman Professor at the Sony Corporation Career Development and associate professor at the MIT Media Lab, Oxman is the founder of the research group Mediated Matters. One of her latest projects, Mushtari, exploits the potential of 3D printing complex forms and of computational design, in order to show how sophisticated forms of life as humans and the most primitive ones can work together to achieve mutual benefits. Mushtari is a wearable structure, similar to a plant wrapped around the body, composed of 58 meters of channels in which flows a liquid solution which acts as a bacteria factory. Its shape has been designed with the goal of creating a kind of artificial organ to consume and digest biomass, absorb nutrients and excrete waste. The peristaltic movement  of the traslucid material inside the 3d printed cavities is designed to promote the activity of cyanobacteria of converting the light of day in sucrose. Mushtari, whose name in Arabic means Jupiter, is part of Wanderers series , realized on the occasion of the exhibition “The Sixth Element: Exploring the Natural Beauty of 3D Printing” made by the company Stratasys, 25-28 November 2014 at EuroMold in Frankfurt. The Wanderers series explores the possibility of creating wearable devices to ensure human survival in imaginary interplanetary travels, and was carried out by Neri Oxman in collaboration with Will Patrick and Sunanda Sharma, both researchers Mediated Matters Group. Each project is designed to interact with a specific feature of the surrounding environment (considered to be a hostile environment for the human being as the other planets do not have characteristics suited to human life) and produce a useful resource to the individual for its survival. Mushtari is an example of generative design,  a subset of computational design that mimics the evolutionary approach of Nature. Following a specific objective, exploiting the potential of the computer, all possible solutions and variants are analysed in order to identify the optimum one through a series of tests and inspections at each iteration. In the case of Mushtari the objective was to create a wearable structure to contain a fluid wrapped around the body in a compact way with the smallest volume. To obtain this result has been studied an algorithm that simulates biological growth. Given the complexity of the project and the need to facilitate the operations of symbiotic exchange between the two types of bacteria involved (which require in some moments light and other times dark), it was necessary to obtain a structure with different degrees of transparency to light, so a 3D printer capable of printing multi-material was used. The research project Mushtari poses some interesting questions for further discussion in order to apply advanced computational capabilities to fashion and exploring the potentials of generative design. In 4D printing the fourth dimension is represented by time. Printed elements can assume, in response to the external environment stimuli, such as immersion in water, previously programmed forms but different from the starting one. . Some early experiments in this direction have been conducted by the Harvard University and MIT. One of the first methods that allowed to add a formal variability in time to a 3D printed item has however been kinematics, or the science that studies the motion of bodies in time regardless of the physical characteristics of the same bodies and the causes of motion, is therefore also called “geometry of the movement”. Examples that use this strategy are Kinematic Dress and Kinematic Petals Dress made by Nervous System. It is a design studio founded in 2007 by Jessica Rosenkrantz, MIT graduate in architecture and biology, and Jesse Louis-Rosenberg, who studied Mathematics at the same university. In these dresses, kinematics is used to 3D print complex structures, composed of multiple rigid elements, concatenated together. Such structures, taking advantage of computer simulations, can be folded back on themselves to reduce their volume during the printing phase, and at a later time, they can be opened changing in fact their shape. These structures are composed of hundreds of individual parts and so they have a flexible behaviour and can adhere on the body in a way similar to a fabric. The interlocked elements are printed already joined. The digital model of the folding structure is folded on itself already in the design phase, according to a strategy called smart folding, so as to optimize the final volume to be printed and maintain the minimum distances in order to avoid the pieces, once printed, could stick to each other. 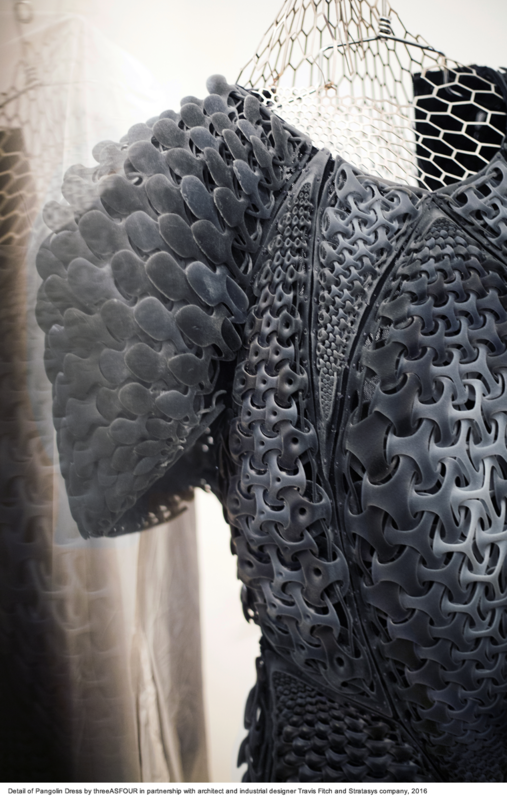 The Kinematics Dress, which is now part of the MOMA collection, was printed in nylon with the Selective Laser Sintering technique, at the New York Shapeways Factory. Drawn with a deep back neckline and a full skirt, it has got a remarkable fluidity to follow the movements of the wearer. Its structure is not homogeneous, but has been designed to obtain the variations in stiffness, drape, flexibility, porosity and texture. The dress can be customized according to the size and the digital model of the user’s body. The Kinematic Petals Dress is based on the same folding structure of the previous garment, but with the addition of a shape somewhere between shell and petal. The element of greatest interest for this second dress is that, in addition to the size variations, in this second project each individual element was thought to be more customizable by the user through an application specially created: the Kinematics App, it is thus possible to vary the size of the petals, their directions and their shape. From the considerations described above, you can see how the computational fashion is a fascinating phenomenon, and much more complex than is often highlighted in fashion reportages. The formal potential of 3D printing opens up the possibility of giving life to shapes before literally impossible to generate because of their complexity and therefore opens the way to new aesthetic lines for fashion, as well as to new performance for clothing. It should be stressed, however, that, in order to obtain a haute couture dress, such as those presented in this article, it requires a preliminary research , three-dimensional modeling and patternmaking professional skills, and the use of printers with high performances. Theoretically at home with a small 3D printer you can replicate a dress, but considering current development of additive manufacturing technology, there are still limitations in the final outcome with respect to the surface quality of the finished product and its strength. In order to obtain a prêt-à-porter garment, 3D printed pieces need to be coupled with traditional fabrics, requiring the user patternmaking skills. Very often also creations, due to the current limitations of the printers moulding chamber, must be realized decomposed into parts which are then assembled manually. However the dresses described above can be thought as haute couture pieces, because of their beauty and because that the production time can be similar if you make prints simultaneously on several printers. Considering instead the ready-to-wear, on a large scale three-dimensional printing technology is still pretty slow compared to traditional production techniques of fashion industry. 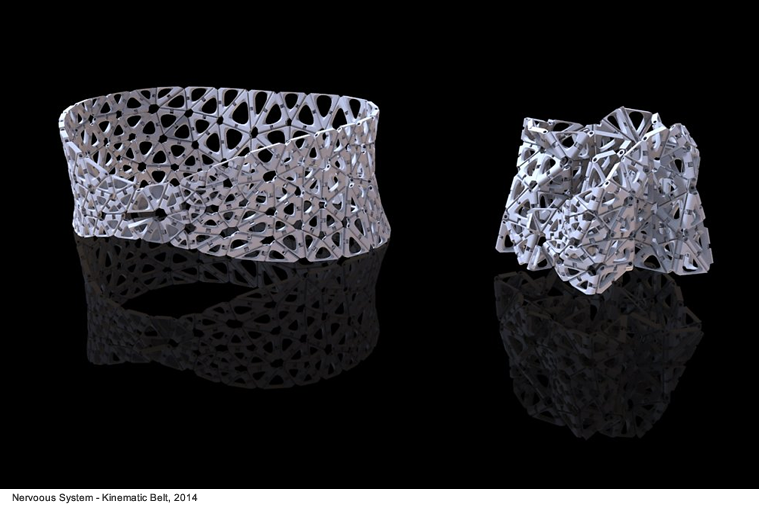 3D printing undoubtedly presents several novelty points as the push to return to tailored made design. It has brought to the attention of the media and of the users the need to create accurate measurements of the human body, as Jon Cilley told us. Another item of interest is research materials: all big 3D printing companies are carrying out experiments on new materials, therefore in the near future we can have new experiences in wearing the results of computational fashion. You can mention in this connection shape memory materials and the first experiments with respect to 4D printing. 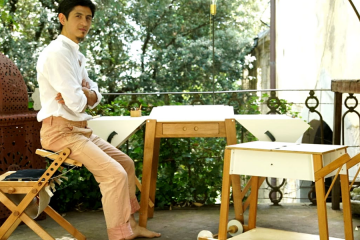 – Interview with Francis Bitonti, founder of Bitonti Studio, by Maddalena Mometti on June 1 2016. 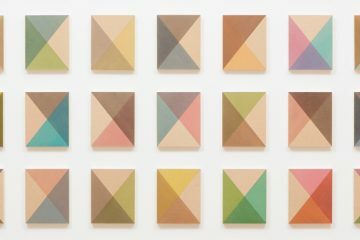 – Interview with Gabrier Asfour, co-founder of threeASFOUR, by Maddalena Mometti on August 1, 2016. – For more information about state of art of Body Scanner technologies, you can see: Massimiliano Ciammaichella. 2001. Disegno digitale per la moda. Dal figurino all’avatar. Aracne editriece Srl. Roma, Nicola D’Apuzzo. 2009. “Recent advances in full 3D body scanning with applications to fashion and apparel”. In Gruen, A., Kahmen, H. (Eds. ), Optical 3-D Measurement Techniques IX, Vienna, Austria. – The peristaltic movement is the coordinate contraction of smooth muscles present in tubular organs, which determines a wave movement that allows the substances present in the tubular cavity to move in a certain direction. This movement is typical for example of the intestine and in other human digestive tracts. – For more information you can see: Ford Sharon. “Additive Manufacturing Technology: Potential Implications for U.S. Manufacturing Competitiveness.” Journal of International Commerce and Economics. Published electronically September 2014. http://www.usitc.gov/journals.